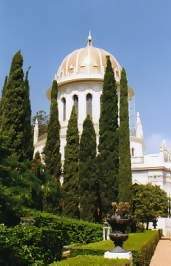 The Bahá’i Holy Places in Haifa and the Western Galilee represent the Bahá’i faith and their pilgrimage tradition. The Bahá'í Faith is a religion founded by Bahá'u'lláh in nineteenth-century Persia. There are an estimated five to six million Bahá'ís around the world in more than 200 countries and territories. The designated site consists of 26 different monuments in the northern Israeli cities Acre and Haifa. In 2000 I visited Haifa, about 2 hours north of Jerusalem by public bus. A different world again: warm and dusty here. The city is built against a steep slope. The local Baha'i-temple is the shiny highlight in this rather disappointing city (sorry to the locals!). You can have a look inside the temple, but there's not much to see for the casual visitor. 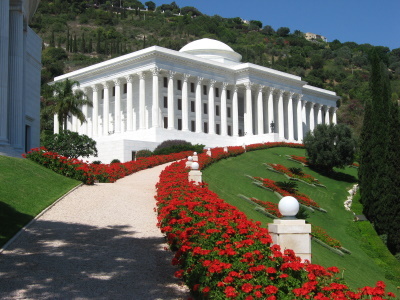 I have visited the Baha'i Holy Places twice now, and both times I've had limited access to the gardens in Haifa. Really just bad luck. 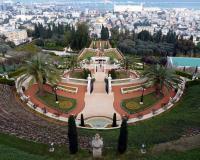 The gardens are beautiful and are one of the top attractions for tourists visiting Haifa. At the top of the gardens, you get a great view of the entire city and the harbor. The view from the bottom of the gardens at night is spectacular and it is a great place to eat in the evening as well. Make sure to check before you arrive as to the operating hours of the garden and if there are any holy days or other special events going on. On my first trip I could only take photos through the gate. On my second trip, I could only visit a limited part of the garden. 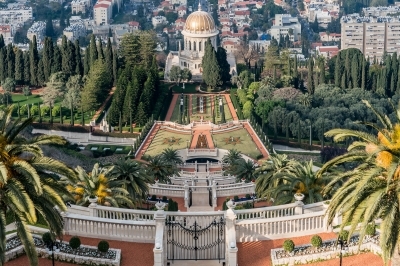 I visited the gardens and shrine in Haifa and I agree with the reviews below: There is a great view over the Haifa bay and the place itself looks spectacular, but I cannot see any OUV there. In summary: it is a tourist trap, I can see reason of inscription only to attract the tourist for visiting of Haifa, that is perfectly located but do not offer anything that can be called as a world class site. We had intended trying to fit in several of the 11 locations at Haifa and Akko within this inscription but, in the end, time constraints limited us to the North Slope of Mt Carmel and its structures - or such as non-believers are allowed to see/enter!! So this means the Terrace Gardens and external views of the Shrine of the Bab together with the “Arc” of administrative buildings which are situated next to the terraces (The Seat of the Universal House of Justice, Seat of the International Teaching Centre, the International Archives and the Centre for the Study of the Sacred Texts). The Terraces were built as recently as 1990-2001 whilst the Arc buildings date to the 1950s through to the 1980s. The shrine itself dates back to an original “simple” building from 1899-1909 but was given its current grandiose appearance with gold dome and Corinthian columns between 1948/53. There is no doubt that the terraces are “impressive” for their grandiosity, climbing some 225 metres in 1 km, particularly when seen from the bottom (at top end of Ben Guirion St, Haifa’s - main restaurant area). Having seen them from the bottom in the evening (visitors are allowed to ascend just to the first “balcony”) we went to the top the next day and planned to take the noon English tour down through the gardens. There you can again freely descend to the first “balcony” without taking a “tour”. The view from the top over Haifa is fine but no better than from other places along the same road. The view down the terraces themselves I didn’t find as impressive as looking up. I wish we had limited our visit to these 2 easily accessible areas, but we decided to go for the noon tour even though one can no longer book them. We actually arrived at 10.55 from out of town and found just a handful of people waiting for the 11am Hebrew tour. So we decided to have a look around the top area first and come back at 11.25 to start queuing for the English tour. BIG mistake!!! When we returned, there were well over 100 Russians/Japanese and assorted other nationalities from coach tours all waiting for an English language tour limited to 60 people! At least they didn’t shut the door after the first 60 but it was 12.40 before we got in on a Hebrew language tour we could have gone on 1 hr 40 minutes earlier! Moral – take the first tour you can get and the English language tour is primarily filled with non Hebrew speakers who may or may not speak English! In fact we were given a little brochure in English, the guide had relatively little to say anyway and was able to answer questions in English if asked. Bear in mind that the tour finishes half way down the terraces from where we had to return to our car at the top by road (not as direct as the way down!) on foot or by taxi! Perhaps I was no longer mentally attuned to appreciating what I was seeing but I found the series of identical balconies with their similar gardens and cheap looking red gravel rather boring – especially as the shrine we were approaching was closed to us anyway. January may not have been the best time to see the gardens even in Israel and large areas were looking a bit thin. This is no “Generalife”, despite the fountains and running water. The buildings making up the “Arc” were pompous copies of classical structures - or perhaps pompous copies of US copies of classical structures? In any case they did not impress. It is interesting to read the ICOMOS evaluations of the nomination – the first for the 2007 WHC which “referred” it and the second for the 2008. The first concluded that the nominated buildings really had no architectural merit at all (“The OUV of the collection of buildings cannot be justified in terms of their intrinsic historical, artistic or scientific merits”). Such merit as the entire collection possessed related solely to the value placed upon them by the Bahai faith – which ICOMOS didn’t feel qualified to pass judgement on!! As such, only criterion vi could even be considered appropriate (“Directly or tangibly associated with .. beliefs and traditions” etc) which was a problem as the WHC didn’t like inscriptions on vi alone and ICOMOS didn’t consider that criterion iii was met! One year later both iii and vi were considered appropriate although the only changes to the nomination were to matters of management and protection plus some additional “arguments”. It is difficult to see why. Clearly there is a problem evaluating sites in terms of OUV when their value is primarily/solely to the religion they represent – with their inscription on the basis of just criteria iii and vi the Bahai holy places are in the same company as Lumbini, Fujisan and Sulaiman-too. But where should UNESCO stop in trying to be even handed towards the central sites of all religions and cultures irrespective of their artistic/architectural merit? The Cao Dai temple in Tay Nihn? The Mormon Tabernacle (there are 3 times as many Mormons in the world as Bahais)? Gapyeong Unification Church? The major centres of Scientology in US/UK? The Bahai religion generally gets a “good press” with its messages of equality, universality and peace and the discrimination against its adherents in many countries past and present. There doesn’t seem much to oppose in fact!! But one thing does surprise me – its approach to Israelis both in Israel and elsewhere - “in keeping with a policy that has been strictly followed since the days of Bahaullah, Baha'is do not teach the Faith in Israel. Likewise, the Faith is not taught to Israelis abroad if they intend to return to Israel”…….”whenever an Israeli citizen living in the West, irrespective of his background and religious affiliation, declares his belief and interest in becoming a member of the Baha'i community, he should be informed that the Faith is not taught in Israel and that there is no Baha'i community there apart from those who are associated with the Baha'i World Center. He cannot be accepted into the Baha'i community if he is planning to return to Israel to reside there. If he plans to continue to reside outside Israel, his enrollment can be accepted, but he will then be subject to the same restrictions about travel to Israel as any other Baha'i, in that he could do so only with the express permission of the Universal House of Justice. In any event, the Universal House of Justice should be informed of any such declaration” Very strange! I can’t work out how much this is driven by Bahais, or how much is a tacit agreement with Israel to avoid upsetting the status quo regarding the Bahai “use” of Israel for its Holy Places. I had bad luck with my visit to Baha'i gardens and the Shrine of the Bab in Haifa. Gardens are closed if it's rainy day (because the stairs are really slippery when they're wet) and it was raining every morning of my stay so the gardens stayed closed. The shrine was also under construction so the site wasn't that impressing looking. In my visit to Akko I took the local bus to Bahje house and the Baha'i gardens around it. The house, which was the home of Baha'ullah, is open only in the morning (for Baha'is it's always open) so it was closed when I visited it in the afternoon. You get the see the gardens outside which were very clean and straight like the ones in Haifa. Doorman at the gate gives you an information leaflet in your own language (he said they have it in every language, I doubt it). The Bahje house looks like any other Mediterranean mansion built in the 1800s. More interesting was to watch the pilgrims going to see the holiest place of their religion. I think that if you like gardens this place is worth of visit, by bus it was only 10 minutes from Akko. I only visited the most famous part of this complex: the Shrine of the Bab and the Persian gardens which surround it (in Haifa). It is a peacefully, pretty place. The gardens are terraced, which makes them look neat from both above and below. A profusion of purple a green colours greet the visitor. The gardens are great, and make good use of the path in the artistic beauty, something not seen everywhere. The view from the gardens over Haifa, and the plains and mountains of Israel is one of the best views you will ever find in Israel. On to the Shrine, which pales in comparison to the gardens. It is a nice, elegant building: but not spectacular, it would not top anyones list of most amazing buildings. However it is situated in the best possible spot in relation to the gardens. This makes a complete picture of loveliness. This site deserves its inscription on the World Heritage List mostly on its importance to the Baha'i Faith, not its architectural merit (although I think the garden could hold up to the best in the world). This site however is quite easy to visit while one is in Israel. Israel is a small country, and Haifa is only 1 hour from Jerusalem, and less from Tel-Aviv. Israel is a wonderful country and I highly recommend a visit!!!! 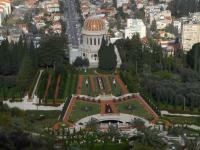 The only Bahai site in Israel I've been to is the Bahai Temple in Haifa. It's situated atop the Carmel and overlooks the harbour and the German Colony. The gardens follow the "falling" type, meaning they literally cover the entire sloap of the mountain. You need to reserve a guided tour in which you get to hear about the Bahai faith. This is the only way to visit the site but these visits cost nothing. Disappointingly, you are only allowed to step downhill as stepping uphill is reserved for Bahai pilgrims. Prison: Includes Prison in Acre, where Bahá'u'lláh, His family and some 70 of His followers were imprisoned in the barracks from 31 August 1868 to 4 November 1870. Baha’u’llah: Had a summer house and died (1892) at the Mansion of Bahjí. He was buried at a shrine next to the mansion. Unusual Entry Requirements or Restrictions: In the Bahai Gardens visitors are allowed only to descend the terraces and not to ascend them, an act reserved to Bahai worshippers alone. The visitors are accompanied by guides who make sure the visitors follow this rule. 161 Community Members have visited.